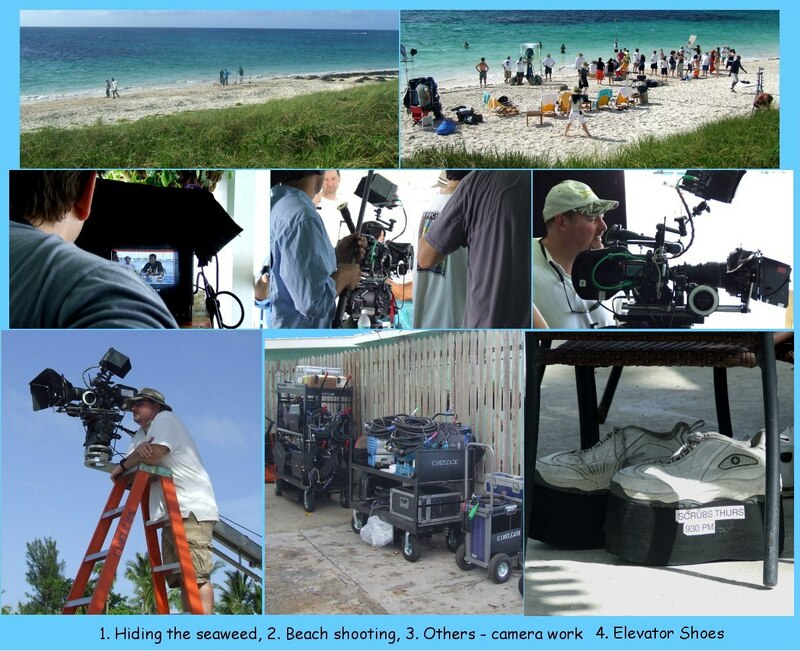 Scrubs TV Show - My Soul on Fire, shot in Hope Town Abaco Bahamas. Place here at the Lodge during your stay. We certainly hope you share in the excitement! During breakfast and lunch on one or both of those days. Upon arrival we asked if the shooting was on schedule and how many would be arriving. We were told they were on schedule which would mean we'd be there for two of three days of shooting. "As for the number that would be arriving (cast & crew)", I asked - 93. Yikes! I knew they all couldn't be staying at the Lodge, they weren't. Sunday, wires were being laid to power the filming equipment. The crew brought their own generator as I would suspect one of their spot lights would blow the fuse for the whole island. - Good thing. We got to meet the assistant director Richard, assistant producer, Randall, Exec Producer Bill Lawrence who's dad owns a home on the island. 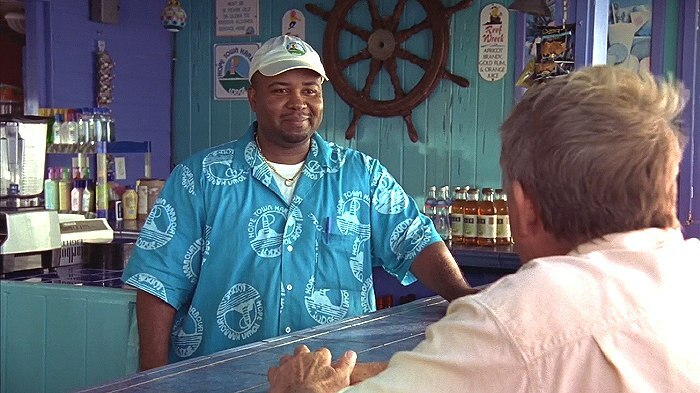 Could that be why Scrubs was shot in Hope Town? The Lodge guests and passerby's got mingle and chat along with the cast and crew on a regular basis as there were frequent breaks. They were most generous in allowing photography even when when they were shooting (unless your camera clicked). Some Scrubs Trivia: We were told that they still shoot film - 16 mm of a special type for video transfer. What do you know? 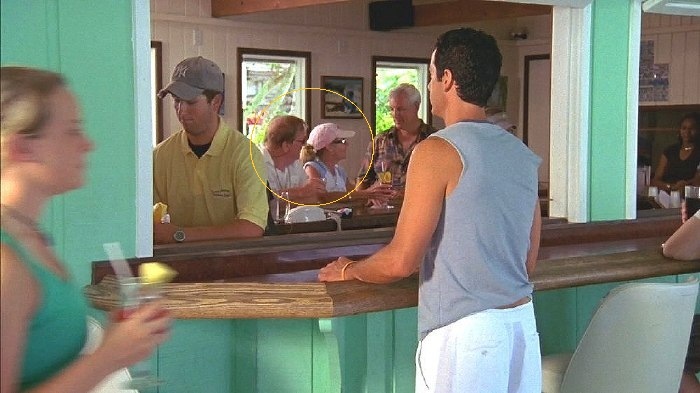 And another tidbit of interest, at Captain Jacks we got to talking to a couple adjacent to us. We mentioned the Scrubs filming to which she replied that she was part of the group, the legal part, and represented union interests because they were shooting in a foreign country. What do you know? More trivia: Touchstone, an ABC / Disney company produced Scrubs and sold it to NBC, but this year the show will be switching to ABC, yet they still owe four shows to NBC due to the writers strike. So the episode date for the shoot in Hope Town is still up in the air. What do you know? We got to talking to a camera man who had worked on CSI Miami. I asked him what he thought of David Caruso. "Not much", temperamental and limited to 3-4 poses with a total script vocabulary of about 35 words. What do you know? Finally There was about a half dozen locals featured in the episode. A few of those were Gary, Bartender of the H.T.H.L. Pool Bar. Shane, bartender at Harbour's Edge and Ira Key, long time H.T. resident and fisherman. And Yes, Debbie and I made the cut, all be it for 3 seconds and we didn't find out till it aired 10 months later!. 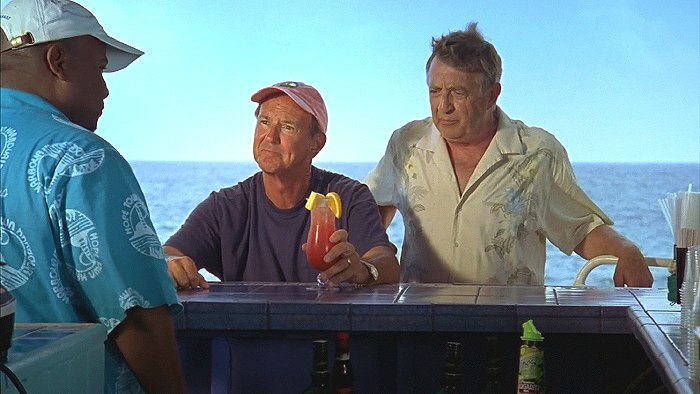 We were sitting at the Bar at the Harbour's Edge along with Kemp and Eric, two other extras. We were instructed to engage in conversation and pronounce Peas & carrots, peas & carrots, only silently. They gave me another tee-shirt to wear. Seemes no AbacoEscape.com logo would be allowed - nuts! Not that you'd see it anyway. And no NY Jets hat either. They took three takes. All of us had assorted drinks of pretty colors in different type glasses. Mine was appropriately enough, in a scotch on the rocks low-ball glass. But there was young fellow (18-20) who didn't look old enough to have a martini glass in front of him, so the props person switched it to a coke - She aaid "ABC wouldn't like a young fellow drinking a martini!" A lot of the shooting was done on the beach in front of the Lodge. and seaweed doesn't make for a pretty beach. As it was on Green Turtle Cay the seaweed problem persisted here also. So what to do? Hire some Haitians to rake the beach. This was accomplished by digging a ditch and burying the seaweed under the sand. Only problem the seaweed was back a couple hours later. Somehow they shot their scenes and over came this difficulty. At the time, it was a mystery to us how all the bits and pieces that we were seeing being shot, would fit together. The Show aired in two half hour segments in April of the following year, titled, "My Soul is on Fire". You'll see Debbie & I sitting at the far side of the bar at Harbour's Edge chatting with another patron. (Top right 3 clips) The bartender is the Harbour's Edge staff regular bartender Shane. The Actor who back is to us is L.I. native Robert Maschio who plays Dr. Todd Quinlan. As for our opinion of the show, in a word, embarrassing. I'm not a TV critic so I wont go there. On a positive note, the excitement of the shooting made for a fun event during our visit. 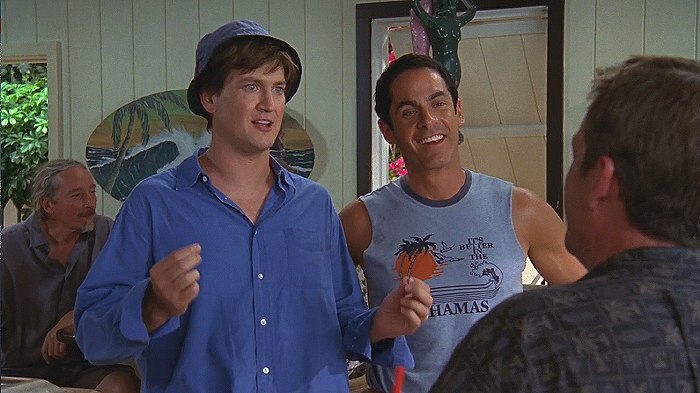 So putting those pieces together, I submit they add up to Scrubs being shot in Hope Town at no doubt at great expense for an entourage of 93 and for a show of such low ratings. But for the community's economic gain and the tourist pleasure watching the shoot the event was a great success. These are 3 of a dozen frames I lifted from the show of our three seconds of fame. 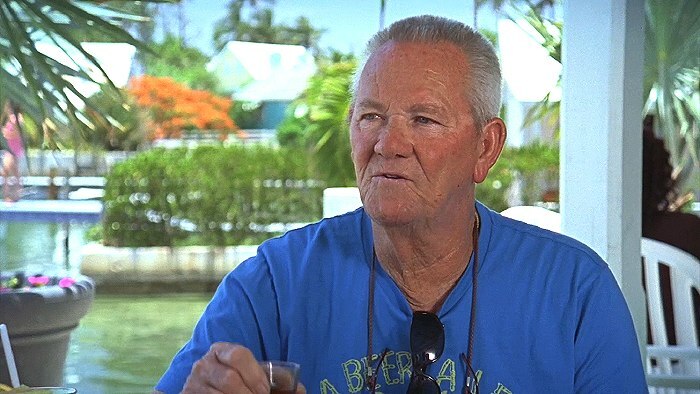 Every Body's friend, Gary - Bartender at Pool Bar H.T.H.L. 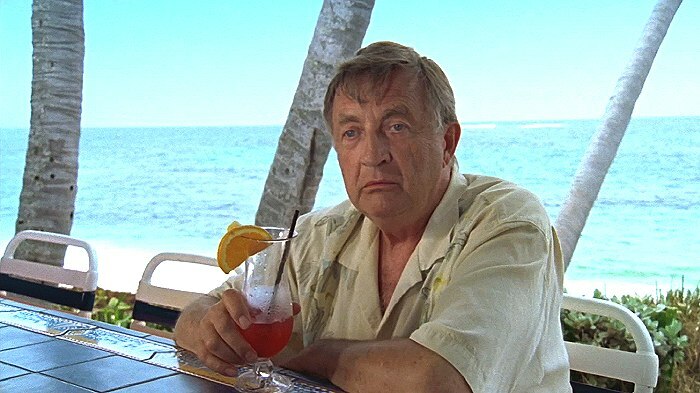 Closing Scene, Dr. Bob Kelso (Ken Jenkins) having his 20th Bahama Momma.